Risotto is one of those dishes that you might order in a restaurant but would never think of making yourself. It's true that it requires a certain amount of practise to perfect but the actual preparation and cooking techniques are relatively simple: the key to the success of a risotto is patience. All rice contains starch and you usually rinse rice thoroughly before cooking it to get rid of a lot of the excess starch. This is to ensure that the grains separate and are nice and fluffy when you come to serve the rice. However you actually want the opposite effect when you're making a risotto. The rice should bind together without the grains breaking down and it's the starch that helps this happen. It's also very important that you use proper risotto rice in order to achieve the desired consistency. Arborio and carneroli are two varieties that you should be able to find easily in your local supermarket. The grains are shorter and thicker than other varieties and they are able to soak up a lot of liquid, increasing to about three times their original size. Finely chop two garlic cloves and one small onion. Grate about 50g Parmesan cheese. Prepare 900ml of vegetable stock in a small pan (using a stock cube or, better still, homemade stock). Bring to a simmer and stir with a ladle. Heat 1 tablespoon of olive oil and a small knob of butter in a large pan and add the onion, then the garlic. Cook, stirring, over a low heat for a few minutes until the onion softens. Add 250g risotto rice to the pan and stir well so that all the grains are coated in the oil. Add a ladle of stock to the rice. Stir well until the liquid has evaporated. Keep adding 1 ladleful of stock at a time to the rice and stir constantly so that the liquid continues to be soaked up by the rice but the rice doesn't stick to the pan. When all the stock has been used, turn off the heat and stir in half the Parmesan. Cover the pan, remove from the heat and leave for a couple of minutes. Give the risotto another stir and serve with the remaining Parmesan sprinkled over the top. It should be a wet consistency but not sloppy. These make a great flavour and colour combination. Chop a couple of rashers of streaky bacon and fry off in a little oil. Add at the end of cooking the risotto. Add half a cup of cooked peas at the same time. A couple of handfuls of frozen, defrosted prawns (shelled) added for the last five minutes of cooking time give a lovely texture and flavour. Chop a mixture of mushrooms (chestnut, oyster etc) and fry in a little oil. Add to the risotto towards the end of cooking. 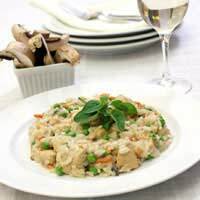 Risotto is a really versatile dish that can be adapted to any occasion and to suit individual tastes. Once you've mastered the basic recipe you should try experimenting with other ingredients.